Consacree a la restitution de la Tradition originelle, source commune des traditions religieuses et philosophiques. Paris France. Language: French. Publisher: Chacornac; Librairie generale des sciences occultes. Editor: Un groupe d'etudiants inconnus et sinceres, directeur, F. Ch. Barlet (until November 1902), Julien Lejay; "Aia Aziz" (Max Theon). 1/1, January 1901-7/12, December 1908; 8/1, January 1934-11/12, December 1937. 64 pp., 10 francs a year. Not published April-June 1901, April-December 1903, and 1908-1934. F.-Ch. 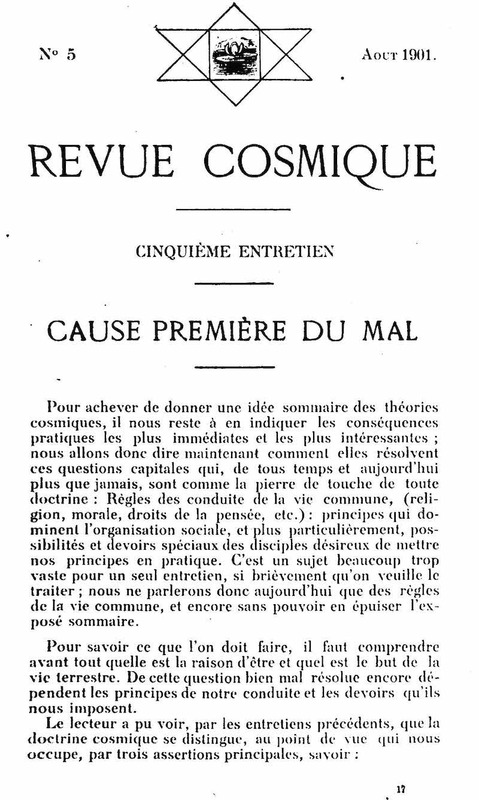 Barlet (A. Faucheux) (1838-1923) was the prime original mover of this journal which was published to propagate the Original Tradition, as taught by "Max Theon" (Louis Maximil(l)ian Bimstein, 1848?-1927). Theon and his wife, Una (Mary Christyne Ware), were the primary contributors. Theon was involved in the beginnings of the H.B. of L., as Barlet had been the chief exponent of that group in France. In late 1902, Theon (under the name "Aia Aziz") took over the journal because of Barlet's insistence that the journal was too "Jewish" in its presentation and not willing to support the occult "synthesis" that Barlet wanted, but Barlet continued to support the Cosmic Tradition and Theon until January 1908 when Aia Aziz condemned the flamboyant confidence man Alberto de Sarak under whose influence Barlet had fallen. See the note under L'etoile d'Orient. The work of the journal was taken up later by Louis Moise Themanlys in La Tradition Cosmique, no copy of which seems to have survived. Dorbon 6531. BNF; Universiteit Utrecht; Ohio University; Yale University; University of Wisconsin.